Hi Brooke Joyce , You've got a good sound. Hit me up on email at ethan@khsx-radio.com. Ethan www.khsx-radio.com 2 years 9 months ago. I appreciated your message and music at Luther yesterday 3 years 5 months ago. Lets get some LSM 2012 love for Brooke Joyce! 6 years 9 months ago. Guys I have This is the Locrian Song stuck in my head. 7 years 8 months ago. Brook Joyce CAN compose in Locrian mode, even if it doesn't exist. Brook Joyce CAN make music in an echoic chamber. 7 years 9 months ago. 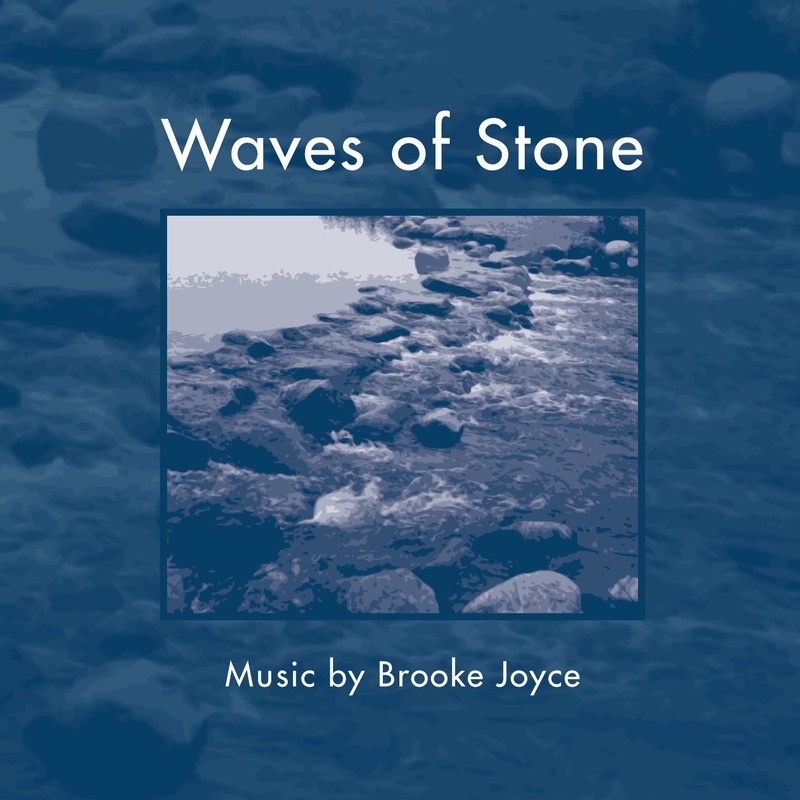 Brooke Joyce's music has been described as “exceptionally gripping” by the Los Angeles Times and “vividly pictorial” by the San Francisco Chronicle. His debut CD, Waves of Stone, draws inspiration from a wide variety of sources: from his Midwestern home to ancient Chinese philosophy to his pet dog. With lyricism, humor and captivating rhythmic drive this is dramatic music that grabs you by the scruff and doesn't let go until the story has been told. Six Degrees of Separation, an exuberant, virtuosic study in rhythm and color for six instruments, begins the CD with a jolt of energy. dark waters, for cello and piano, was inspired by the music of late-period Liszt, the paintings of Mark Rothko, and the experience of canoeing on a mist-enshrouded lake. In Three Iowa Ballads, Joyce draws on the pioneer experience in three divergent tales, spinning spare folk melodies into driving, dramatic explosions of sound. Come up from the fields, father is a lyrical and dramatic setting of one of Walt Whitman’s epic Civil War poems that recalls the devastating effects of war on the home front. The title track of the CD, Waves of Stone, unites the disparate realms of traditional Chinese philosophy and Western music into a complex sound world for piano, 4-hands. The disc ends with toydogmusic, a wild romp shared between toy piano and piccolo, evoking the joyful and fearless spirit of Joyce’s beloved family pug, Roland. Brooke Joyce teaches composition at Luther College in Decorah, Iowa, and is on the summer faculty for The Walden School and the Lutheran Summer Music Academy. Waves of Stone spans fifteen years of composition and introduces listeners to his vivid and rich sound world. Brooke Joyce is an American composer, currently teaching at Luther College in Decorah, Iowa. This disc, on the Innova label, which is run by the American Composers’ Forum, contains six of his chamber works, composed between 1994 and 2008. Six Degrees of Separation has an explosive opening with strong rhythms and a sense of drive. The music breaks away into a Reich-style percussion ostinato and then a static moment builds tension before explosive gestures return. The Reichian movement reappears with the textures building to include the whole ensemble, gradually changing in tempo. This is an interesting work which makes use of varied textures and speeds of development, building in tension and creating a dramatic sense of movement through time. The instrumental ensemble provides varied colours and the use of bright percussion adds a sparkle to the sound, while the piano is mostly used to give weight to the bass end. The ensemble performs with vigour and the piece seems to have its own life-force and energy. Dark Waters is a duo for cello and piano. Joyce immediately creates a sense of atmosphere in the opening moments, with ominous harmonies and repetition in the piano part which allows sounds to linger. The cello and piano are used to good effect and Joyce creates a good balance between a sense of the abstract and memorable material. He cites Liszt and Rothko among his influences for this piece, and both can be detected in his writing. The Three Iowa Ballads are the most recent of the pieces on this disc, composed just last year. The combination of baritone, viola and percussion is an interesting one, with a dark sonority which entices. The first of the songs, The Miner’s Chant is strongly rhythmic with a folk-style influence. The Ballad of Hardin Town is an old-style crime story, and the setting is both dramatic and imaginative. There is something about Joyce’s style which reminds me of Britten, and the folk influence is accentuated by the choice of percussion and the style of harmony. The final song in the set has a lilting feel, reminiscent of a Scottish folk song, and is beautifully phrased. Andrew Whitfield’s baritone voice is a pleasure to listen to and these are well-written songs with a sense of character and imagination. Come up from the fields, father is a setting of a text by Walt Whitman. The tessitura is higher than the previous songs, using soprano voice and high-pitched woodwind. The bass end of the ensemble is provided by piano and cello, although these instruments are also used high in their ranges at the opening of the work. This is another colourful work which integrates the voice into the instrumental sound very well. Waves of Stone, the title track of the disc, was also composed in 2008 and is a three movement work for piano duo. Joyce’s writing gives an almost symphonic feel to the two pianos, with a wide scope of sound and range. These are dramatic pieces which are rhythmically energetic, with ostinati, toccata-style passages and a sense of underlying strength of will. The playing of the Unison Piano Duo (Du Huang and Xiao Hu) is impressive throughout, and this is a successful piece which belongs as part of the piano duo repertoire. The somewhat frivolous toydogmusic ends the disc, a short work for piccolo and toy piano which celebrates toys and small dogs. This is a comical piece which is nevertheless well written and possesses an imaginative sound-world, with the piccolo used mainly in the low register to blend with the metallic sound of the toy piano, rather than being allowed to dominate. This work gives a sense of the composer’s personality and is a fun end to the disc.